Meet Bambam: Bambam is 28 and The Secret is her favourite book. She will miss her brother and best friend whilst in the House. She is bringing drama, entertainment and charm to the House. If she were a world leader, she would change peoples' perceptions about themselves. Actress and singer Oluwabamike “Bambam” Olawunmi joins the House secretly from her family. 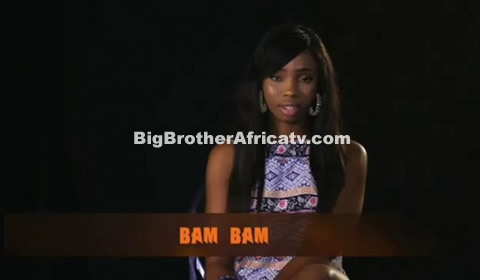 A native of Ogun state, Bambam confessed that binge-watching movies, playing badminton and singing were here favourite pastimes. She attended film school, which was a way to overcome her parents ‘divorce. If Bambam was an animal, she said she would be a black panther that in her own words has “good massage skills”.